In this section the visualization concepts between components and space objects are described. The presented elements are part of the space environment type xml part as introduced in section 03 Domain Model. For convenience the relevant cutout of the xml schema is shown again below. The EnvSupport visualization is clearly decoupled from the domain and interaction aspects. It is defined using perspectives, whereby multiple perspectives can be specified for the same domain model. At runtime between these perspectives can be switched as needed. A perspective has an identifying name attribute and is composed of property elements as well as arbitrary many darwables and pre- and postlayers. A drawable represents the visual counterpart of a space object type. As can be seen in the schema part above it consists of property elements and arbitrary many geometrical shapes composing the look of the object (triangle, rectangle, ellipse, regularpolygon, texturedrectangle and text). The drawable itself is further specified by associating it to a specific objecttype. Additionally, the width, height and rotation can be set. 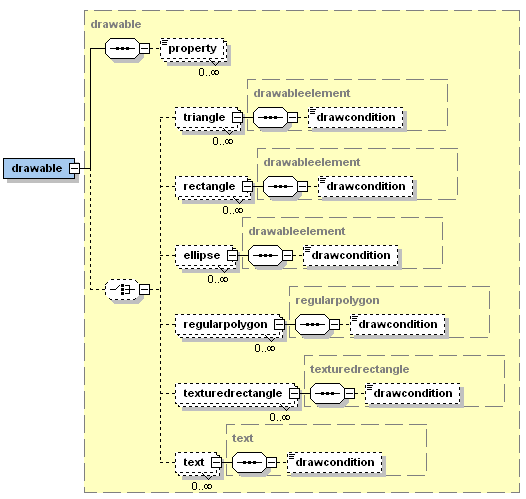 Each geometrical shape contained in the drawable is of type drawableelement and has the attributes described in the list below. layer: An integer for specifying the drawing layer (0 is default). position: An IVector2 or String for the 2d position of the object (relative to the drawable size). If it is a String it must be a property name of the drawable the value is bound to. size: An IVecor2 or String for the shape size (relative to the drawable size). If it is a String it must be a property name of the drawable the value is bound to. rotation: An IVecor3 or String for the rotation according to x, y, z axis (relative to the drawable rotation). If it is a String it must be a property name of the drawable the value is bound to. x: The x value of the position (double or int, relative to the drawable x). y: The y value of the position (double or int, relative to the drawable y). width: The width value of the position (double or int, relative to the drawable width). height: The height value of the position (double or int, relative to the drawable height). rotatex: The rotation x value of the position (double or int, relative to the drawable rotation x). rotatey: The rotation y value of the position (double or int, relative to the drawable rotation y). rotatez: The rotation z value of the position (double or int, relative to the drawable rotation z). abspos: Absolute position value (IVector2 or String). abssize: Absolute size value (IVector2 or String). absrot: Absolute rotation value (IVector2 or String). color: Color value of the shape (String). font: The name of the font. size: An integer for specifying the text's size (12 is default). align: The alignment can either be left, right, or center. In the example above, one drawable is declared. As you can see in the first line, this drawable is mapped onto objects of type prey and the whole drawable spans exactly one grid cell in width and height. As this drawable represents a prey and its vision, two layers are defined. One layer on which the icon is drawn and below this a layer for the vision. 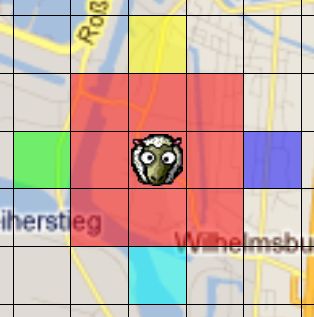 The icon shall be scaled to fill 90% of the grid cell (width=0.9 and height=0.9). The vision consists of five rectangles, a big one spanning 3x3 grid cells and four smaller ones. The x- and y- coordinates represent the horizontal and vertical offset. The color attribute declares, how a rectangle shall be filled, e.g. #00ff007f reads as 00 (=red), ff (=green), 00 (=blue) and 7f (= alpha, i.e. transparency). Prelayers can be used for displaying graphical background elements. These layers are painted before the drawables and postlayers. On the contrary, postlayers are drawn after all other elements. For both layer groups the above depicted kinds of layers can be defined. A gridlayer can be used to paint a grid structure, typically for visualization of Grid2D environments. It is specified using attributes for the color of the grid and the width and height of the grid cells. In contrast, a tiledlayer can be used to paint an image repeatedly. It is declared using an imagepath for the image file name, width and height attributes for the tile size and additionally a color can be defined. The color is modulated on the tiles and changes the underlying look of the tiles. The simplest layer type is the color layer, which is defined by setting color attributes. A color layer changes the background color to the selected color value. In the example above, the prelayer is used to draw the background. In this case an image, which spans only 40% of the overall grid. Because of this, the image is repeatedly drawn horizontally and vertically. If, for example, a street map shall be used, just set width and height to 1.0. The post layer, in contrast to the tiled background layer, is a grid, spanning the whole environment. The row and column count of the grid correspond to the width and height of the envspacetype.